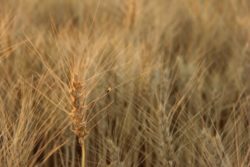 Yesterday’s Close: July wheat futures finished the day down 10 ¾ cents, this after trading in a range of 21 ¼ cents for the day. Funds were estimated to have been sellers of 8,500 contracts. Fundamentals: Wheat futures turned south on the open yesterday on ideas that beneficial weekend rains would help the crop. The USDA released their weekly Crop Progress report yesterday which showed good/excellent ratings unchanged at 36%, this is still well below the 56% we saw for the same time last year. Spring wheat is 79% planted and 37% emerged, this is below last years pace but nearly in line with the 5-year average. Export inspections yesterday morning came in at 341,299 metric tons. Technicals: The market traded in a wide range, testing and holding both our first support and resistance levels which came in at 502 ¾-505 ¾ and 523-524 ¼ respectively. If support holds, that will keep higher lows in place and a breakout above resistance will give the market higher highs. This is what the bulls want to see for a bigger move higher. We have our bias as Bearish/Neutral until a conviction close above resistance.